Located not to far from Main Street, Surf Drive Beach has soft sand and offers calm waters making it a great spot for swimming. Parking is available for a $15 daily fee. This beach has an alcove area that was created by a break wall that is wonderful for toddlers and young children. The area to the right of the break wall has deeper water but no rough surf. The amount of seaweed is minimal in the water. I would suggest having kids wear water shoes due to the pebbles. There has been seaweed on the beach at the high tide mark. It also has restrooms, snack bar, and showers. A water tower by the parking lot can be used to rinse of sandy feet before getting into the car. There is ample parking immediately adjacent to the beach. The sand is soft. We love to go mid afternoon with the grandchildren. 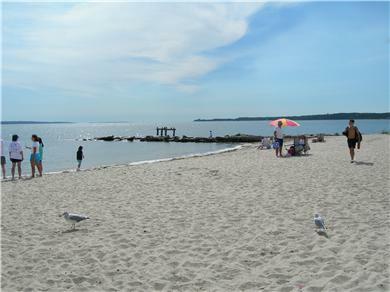 The main beach is on the corner of Shore Street and Surf drive. Open, wide, and alive. Also not many people around after 4:00 pm, which was perfect for us after the heat of the day passed, and cold beer could be had during the swimming. Distance to beach: 300 ft.
S-U-M-M-E-R-T-I-M-E: Falmouth Beach Retreat for Families! Distance to beach: 100 yards to Surf Drive Beach! A roof deck, lakefront location & blocks from the beach! Steps to Ocean Beach, Walk to Falmouth Village, Renovated!